Good Monday Morning Everyone. Hope your Halloween Week End was good. Our weather here in the Chicago burbs was pretty yucky so we did not get a whole lot of trick or treaters this year. The few that braved the weather were really cute. At least what I could see under the layers of coats! I was at Home Goods. You know getting my Home Goods Fix and I came across these sweet pillows. I am doing some change ups in my Master Bedroom. Nothing huge just some bedding change ups and I think these pillows will be perfect. Aren't they sweet. 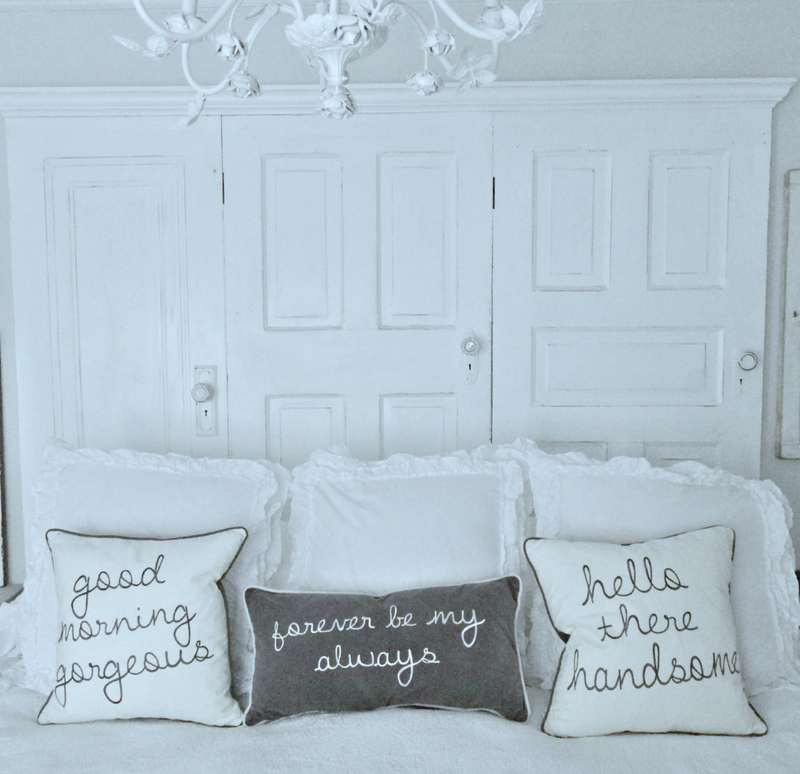 They are gray and a light ivory and embroidered with these sweet cute sayings. So you get to see a little sneak at the new pillows that will be going onto the new bedding. Hope to have that up for you soon. Speaking of bargains. 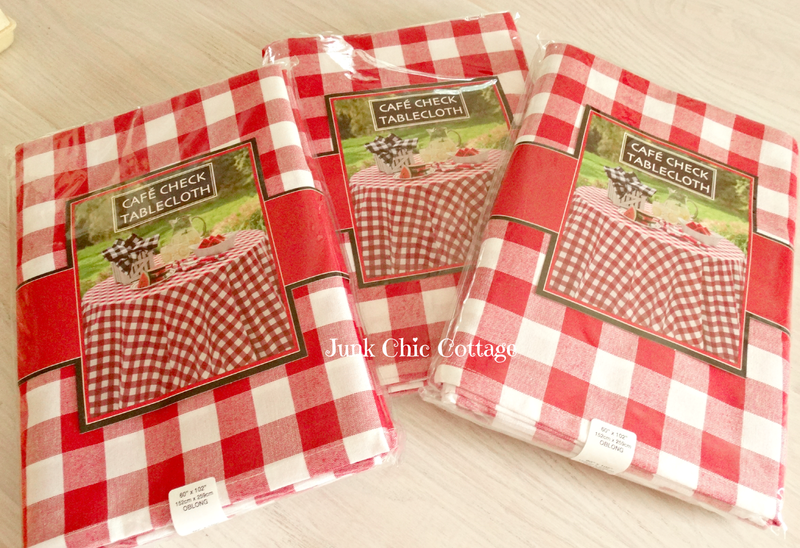 I was strolling through the Stein Mart and came across these sweet red and white checked summer table cloths on the clearance for $3 each. Yep! and I got another 20% off the clearance price so these were less than a couple of bucks each. Had to pull out the trustee 30+++ year old Kenmore this week end. I am doing a simple Nordic Cottage Christmas theme this year. I am adding the traditional Nordic red to my whites. So the table cloths are being made into new Christmas Decor for this year. I can sew a straight line so it is all good!!!!! Have you started to think of your Christmas Decor yet. I start mine early as I have my Girlfriend Charity Christmas Party the first Friday in December so I like to have all my decor done by then. My daughter hosts Thanksgiving at her home so that allows me to decorate early for Christmas. So stay tuned to see what these table cloths get made into for my Red and White Nordic Cottage Christmas Decor. I had my daughter chop some length off and did a long layer pixie cut for me. I do not even blow dry my hair just air dry and a little hair spray. My hair is so thick if I blow dry it will not piece out. So it is now wash and wear hair lol! Sorry about the selfie I really do not take good pictures. So just look at the hair do and not the wrinkles and tired eyes !!!! Have a great week. Hope to have my change ups done this week in the bedroom. Love the new hair do...you're so pretty! I am in a Nordic Christmas mood with red this year, too...and have already started decorating. It's a lot more fun when I start early...and I can have it up longer. I just love the fresh Nordic look and wish I could have the greens up all year! 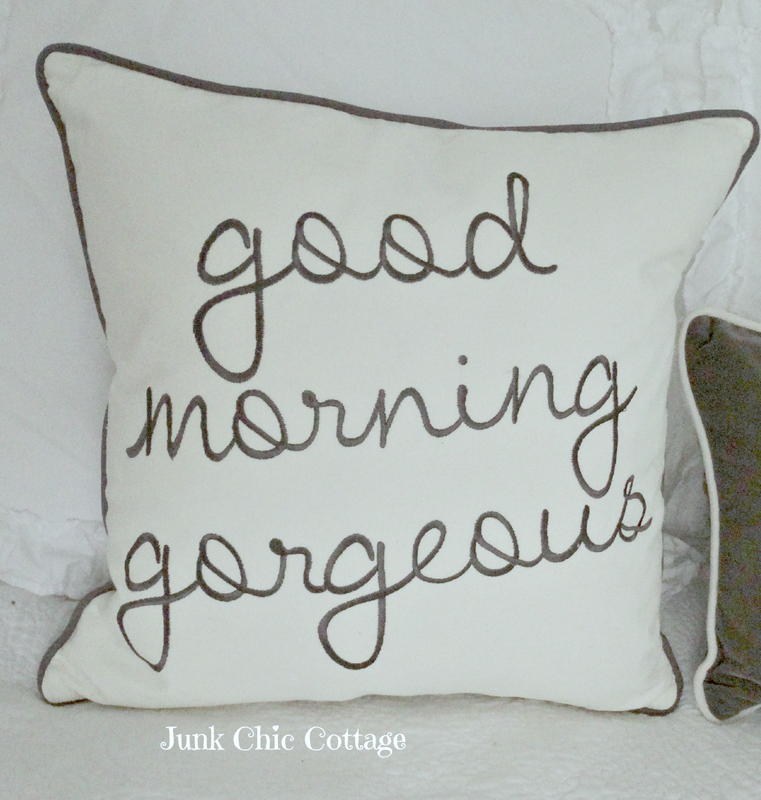 Love your fun new pillows, too! Your hair is beautiful! Love the cut and the color. Yes, I am thinking about Christmas decor. Mostly the mantel...which is always a challenge for me and it an important spot. I am surprised at the red. I just never think of you as being a RED person....lol But I do love red and white at Christmas. I will be anxious to see your place all dolled up for the Holidays. I am still trying to figure out what to do here this year. I think I need a new tree for starters. I am hosting Thanksgiving this year so I won't do any decorating inside until after that...may get my outside stuff up though. What a fun post--catching up on what you've been up to! I like the 'DO'! Love your hair! I LOVE pixie cut. Two years ago my hair was down to my waist and one day I got up and decided to chop it all off for a pixie cut. It felt so good. Now I keep telling my friends, I want a pixie cut again but this time go platinum blonde lol can you imagine me as a platinum blonde. : ) I can't wait to see your Christmas decor soon. Oh you look gorgeous!!! How fun.......can't wait to see! The glitter is flying around here LOL! Great new stuff, Kris. I love your hair! I am due for c&c this week, and was also letting my pixie get 'messy' on purpose. Can't decide what I want, but I think I'm going to keep going, like you, with long layer pixie. I like how you have it cut up over your ears, but still with longer layers.Nice & sharp. Good morning gorgeous! Oh my word. You are too funny. You are gorgeous and blessed to have such a thick head of hair. How wonderful that your daughter cuts hair. I can't wait to see some red in your white space. Great deal on the table cloths. Love the new do and lucky you to have wash and wear hair! Your hair looks super cute! I am excited to see your Christmas decor this year! I just love the Nordic Christmas look! Kris I really love your new hairstyle! Can't wait to see your Christmas decor as well. Have a great week. Love your new do! I would love to have a wash and wear do too...but sadly....my hair has a mind of it's own and has to be "tamed"...lol! The pillows are so sweet and pretty and your new do is super gorgeous! I love it and I think it really highlights your pretty face! Short is more practical for me because I like to swim, but I look like an OLD lady (which I am) when I wear it short so my hair is long. I can't wait to see what you do for Christmas. My theme this year is A Simple Christmas. I have already seen some cute ideas this morning. Your hair-do is adorable!!! The french nordic reds for Christmas will be cheerful. I did that a few years ago and it was so festive. Enjoy. Your pillows are darling, Kris! I'm green with envy that you have such fabulous hair that you can wash and go with beautiful style. Nice finds Kris!! I also got my Home Goods fix this past week. Hopefully I can do a blog post soon. LOVE that store. Your hair is so cute! I am too nervous to cut mine that short...wish I wasn't!! CUTE HAIRSTYLE! I'm just starting to think about Christmas and my "theme"! LOL! I need to go thru my MANY boxes and see what I can use and what jumps out! Your pillows are so cute! Those will look great in your bedroom. I can't wait to see what you make with those tablecloths. What a deal you got on those! I like your haircut. I usually let my hair dry naturally too. Mine is natural curly, so I know all about hair having a mind of it's own! Some days are better than others. LOL! Love the pillows and the tablecloths you got, wow $3. Can't wait to see your Nordic Christmas decor, but I do not put up my holiday decor until after Thanksgiving! My theme is always red and white, why change something I love. Your hair looked good either way! Your hair looks great, Kris! You carry short hair well - I feel like I don't so my hair is always below my chin. Great buy on the tablecloths. How great that you already have plains for them in your Christmas décor, too. I'm not sure when I will start my decorating this year. I usually start first thing in the morning the Friday after Thanksgiving, but this year I am working part-time, so I don't know if I will start it that afternoon when I get home or just wait until Saturday morning. I like to try and get to it right after Thanksgiving so I have a good amount of time to enjoy it. Can't wait to see what you are making with the red and white check cloths! Those pillows are too cute-love them! Love the pillows and love your new "doo"....and I can just imagine what you will be doing with those checked tablecloths!.. Oh I love those tablecloths - I wish we had a Stein Mart here. I'll have to go sorting through the clearance bins when I'm visiting my mom in Florida next week. I LOVE your haircut! I tried growing mine out last year, got it pretty long but it too has a mind of its own and I couldn't wait to chop most of it off last month. 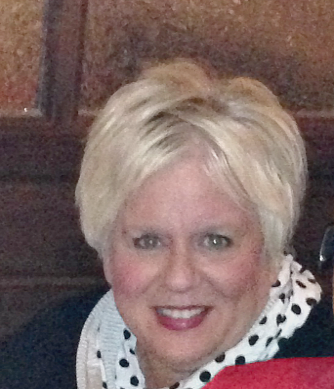 Love your new do, Kris! Wish I had your thick hair!! Your new pillows are adorable, and I love the doors too!! Darling haircut, Kris! I try growing my hair out every decade or so, but I always come back to short, too. 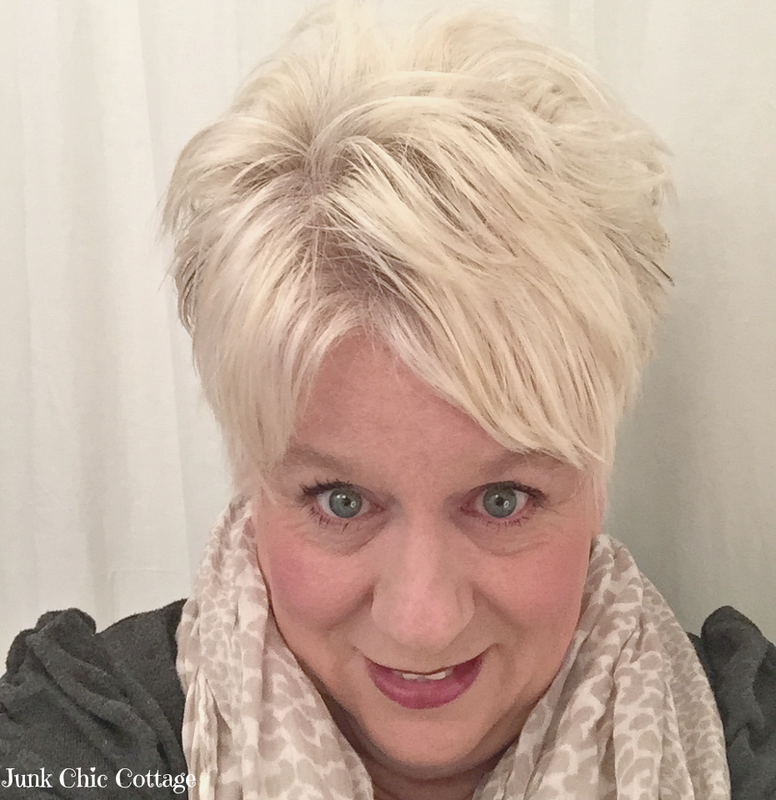 Love your new do- your look fabulous. I tried to grow mine out and it looked like I left my broom outside the door LOL. Made me look older than I am. The pillows are terrific and goes so well with you and Terry - perfect. Stay warm - we are getting 80 degrees Thursday - wish it would go down to 60. Love your new haircut. I'm trying to let my hair grow some, but I'm to the point that I'm about to have it cut off short again. Can't wait to see your Christmas decor for this year. Oh, the blessing of thick hair! Your do is so cute, Kris. You are beautiful! Love, love the new do. You are so fortunate to have such thick hair...mine is fine and less than thick. I have some natural curl/waves/cowlicks so it really has a mind of it's own. :) I've had short hair so long...can never go back! I covet those pillows ~ :) Can't wait to see what your bedroom looks like. Red is my favorite color...along with black & white...so I know your Christmas decor will be gorgeous. I know it's coming sooner than later but I am just not there yet. You are so beautiful! I love your new pillows, they are very cute. I love the table clothes too, i adore red and white for Christmas. Kris, you are a beautiful woman. I even tried dying my hair your colour last summer (just too expensive to keep it up) I loved the young fresh look. I have had a pixie for quite a few years, I can't imagine anything longer. I am not so great at styling my hair, when I even bother. Yesterday, I had my nails painted for the first time. I am trying something new, Shellac on my own natural nails. It is supposed to last up to 5 weeks. Really out of my comfort zone, but so much fun. You have terrific style, both personal and in your home. I love love the pillows and your bargains. Home goods is on my list of favs. 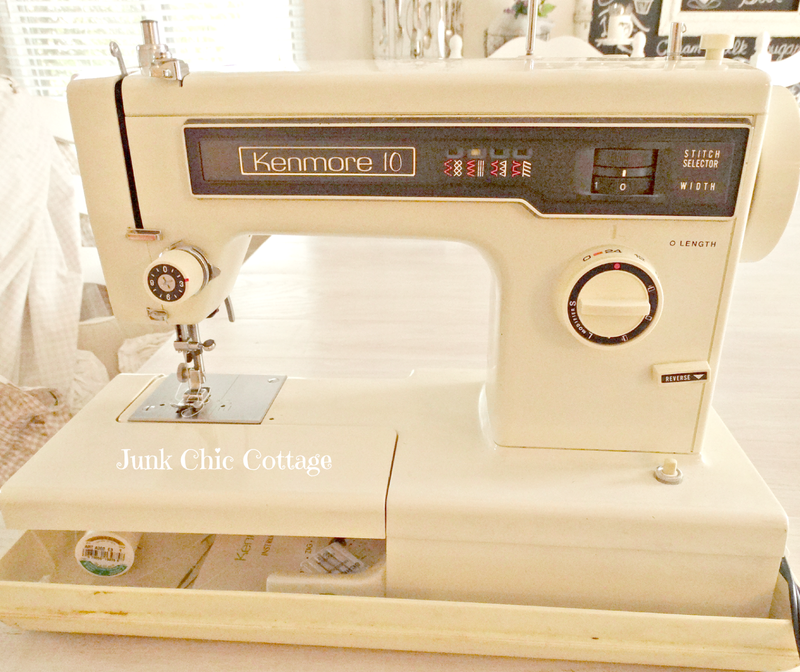 I have just begun sewing the past few months. I decided it was about time to take the plunge. I enjoyed your post. Cute pair of pillows for a cute couple. Love the do and it reminds me of the one Twiggy had so many years ago. 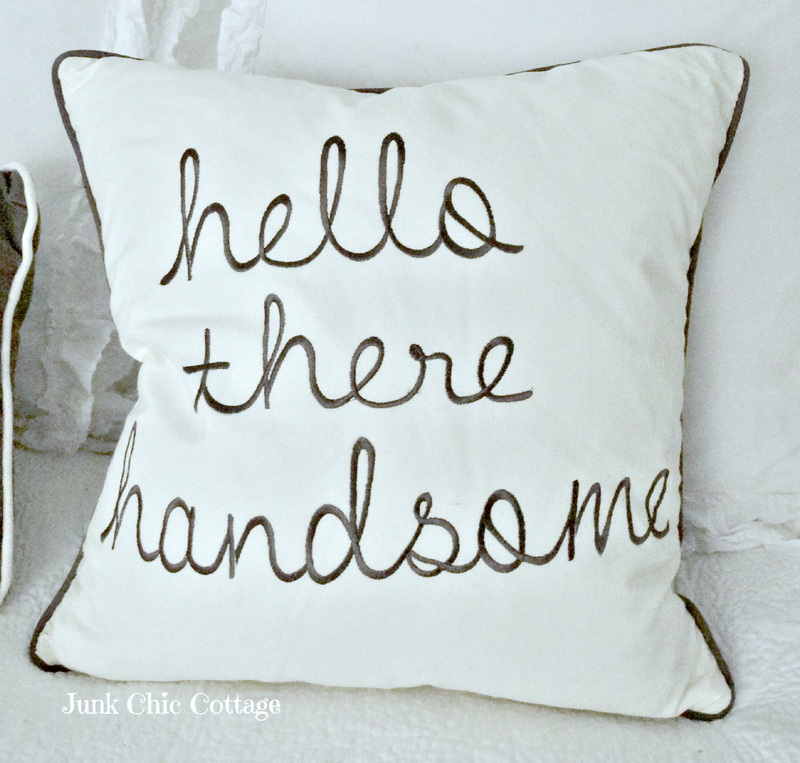 Great pillows you found at HomeGoods- can you believe that the last two times I've gone that I have left emptyhanded? Gasp, I know. Looking forward to seeing your Christmas decor- I know it will be wonderful! Kris I got those same tablecloths at a bargain price too!!! Stein Mart has become my go to place to shop. I hate to say it but I find beter deals and more "cottage style" things here than at any Home Goods store. And I have to say that I like your hair shorter, it just suits you! I am struggling with the same situation with my hair right now .... do I cut or let it keep growing???? Your new haircut looks great and its very flattering. You are really blessed to have thick hair! Speaking of pillows, I found the cutest Pottery Barn lumbar pillows called Colin plaid. For the last several years, I have used more non-traditional colors such as aqua in my Christmas décor. I rarely use much red but these pillows have red, white, black, green and grey in them and just have such a Christmassy look to them. So I will definitely be incorporating more red in my décor this year. I cant wait until many of the blogs start their Holiday House walks so I can get more ideas and inspiration for my décor this year. Thick hair is a blessing! My hair is so thin... I love your long pixie! YOU are beautiful Kris! I love your new pillows and we have something in common... I can sew a straight line too. And that's about it when it comes to sewing :) Have a great weekend!